Keith Allen Miller was born June 12, 1963 in Midland, Michigan. The five foot eleven righty handed hitting Miller was a graduate of Oral Roberts College in Tulsa Oklahoma. Miller was originally signed by the A.L. 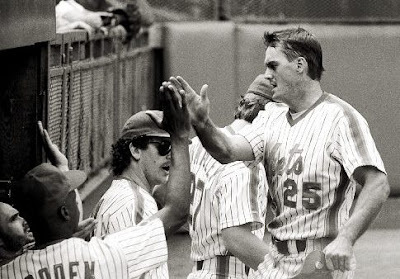 New York team but was a good man and didn’t sign there, opting for the New York Mets in 1984. His fine glove got him to AA Jackson by 1986 where he then hit .329 while stealing 28 bases. In 1987 he was brought up to AAA Tidewater becoming the Tides main second baseman for two seasons, batting a best .281 in 1988. 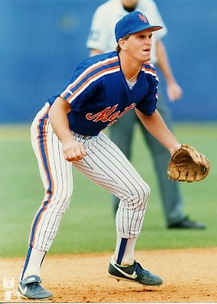 He was brought up briefly in 1987 after the Mets World Championship season to play middle infield behind Wally Backman, Tim Tuefel & Rafael Santana in mid June. 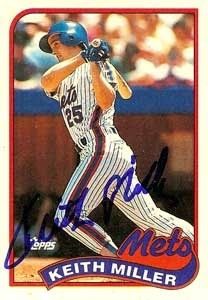 He debuted on June 16th & got two hits in Montreal in a 7-3 Mets win against the Expos. He remained on the team until June 27th, was sent back to Tidewater returning to New York as a September call up. 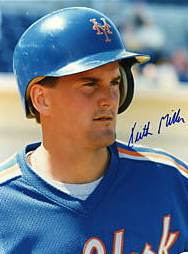 In his rookie year Miller hit .373 (19 – 51), while stealing eight bases, with a pair of triples & doubles. He played the game hard like his hero Pete Rose & was another gritty hardnosed player on a team with Len Dykstra & Wally Backman. As time went on, Miller became the ultimate utility player, playing all infield and outfield positions. In 1988 he came up to the team in May but struggled at the plate. On June 18th he had a big moment as he singled off Philadelphia's Terry Frohwirth with the bases loaded in the bottom of the 9th inning in a tied game at Shea. His single scored Kevin McReynolds with the walk off game winning run. On July 1st he then hit a rare HR against Jim Deshaies & the Astros also at Shea. He never hit as good as he did in his first year, batting only .214 that season & .231 the next year. But he got more playing time by 1990 as he moved to the outfield, sharing time in center (61 games) with Mark Carreon & Daryl Boston. He brought his average up to .258 in 88 games, with one HR eight doubles & 12 RBIs. Defensively he posted a .980 fielding % making one assist. 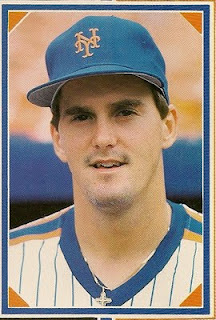 In 1991 he saw the most playing time of his Mets career (98 games) having Mets career highs in hits (77) RBIs (23) & HRs (4) batting a solid .280. On August 30th he helped David Cone to a win when he singled off former Met Randy Meyers in the top of the 7th inning scoring Greg Jeffries on what would be the game winning run to beat the Reds 3-2. In September he hit a 5th inning HR at Shea Stadium which turned out to also be a game winning hit in the Mets 3-2 win. He closed out the year strong, first driving in three of the four Mets runs against the Phillies in a 4-3 Met win on September 29th the last home game of the year, Fan Appreciation Day. Then in the final game of the year at Philadelphia he had a four hit day including a HR driving in two runs. In December 1991, in a blockbuster trade, he was sent to the Kansas City Royals along with Gregg Jefferies and Kevin McReynolds in exchange for Cy Young winner Bret Saberhagen & Bill Pecota. Miller was in the 1992 Royals line up playing in second base, outfield, & DH enjoying career highs in games (106) batting (.284) HRs (4) & RBIs (38) while getting hit by 14 pitches (third most in the AL). The next season he only played 37 games batting a low .167. He only saw a hand full of action over the next two seasons ending his playing career in 1995. In a nine season playing career Miller was a career .262 hitter, with 347 hits 12 HRs 67 doubles 92 RBIs 190 runs scored & a .323 on base % in 465 games. Retirement: After his playing days Miller took his baseball smarts and used them to become a player agent. Most famously he is agent for the Mets All Star David Wright. He has worked an agent for players such as; Scott Rolen, Mike Sweeney & Brandon Inge. Quotes: "I loved playing the game so much that to me it was the best job in the world," he says. "But I look at what I'm doing now as the second-best job in the world.